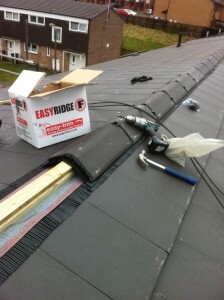 JT Roofing offer a repair and replacement service for all types of Ridge tiles including new dry ridge systems where no mortar or mastic is required. Ridge tiles and gable ends will be one of the first parts of your property to show signs of wear and tear. The ridge tiles are the row of tiles that sit at the uppermost level of the roof and connect the point at which two sloping roof surfaces come together. Usually the mortar goes first on your ridge tiles. JT Roofing offer a free quotation service for the removal and reseating of all types of ridge tiles and re-pointing of all rooflines.